Swaledale is a breed of domestic sheep named after the Yorkshire valley of Swaledale. They are found throughout the more mountainous areas of Great Britain, but particularly in County Durham, Yorkshire, and the lower fells of Cumbria. Swaledales are noted for their off-white wool and curled horns. Well suited to the exposed regions in which they predominantly live, the Swaledales are hardy, thick coated, able bodied, and bold. The ewes make excellent mothers and are known for being able to rear lambs well, even in adverse conditions. They are of a medium build, with black faces, marked with white, and both males and females grow curled horns. Their coats are thick, straight, and coarse. There are approximately 1,200 flocks of pedigree Swaledale sheep in the United Kingdom. Being a hardy breed, farmers are able to rear their Swaledale flocks in remote and exposed locations, generally without needing to provide indoor accommodation. Swaledale mutton has good flavour and tenderness, and some flocks are reared exclusively as meat producers. Wool colour and coarseness prevents Swaledale wool from fetching high prices, but its strong and durable properties make it suitable for carpets, rugs, and insulation. However, the wool is also used for spinning and knitting of clothing, though on a lesser scale to its other uses. The Swaledale sheep is an official symbol of the Yorkshire Dales. In 2003, plans were submitted to build a Swaledale sheep visitor centre in Kirkby Stephen, Cumbria, declaring Kirkby Stephen as the "spiritual home of the Swaledale sheep". These plans drew strong opposition from the town of Hawes, in Yorkshire, a strong competitor in terms of Swaledale sales, and which had its own plans for a visitor centre. As with most pure bred flocks we breed our own female replacements, approx. 25% each year but only occasionally we do use our home bred rams. So every year or sometimes every 2 years we need to purchase a new tup (ram). 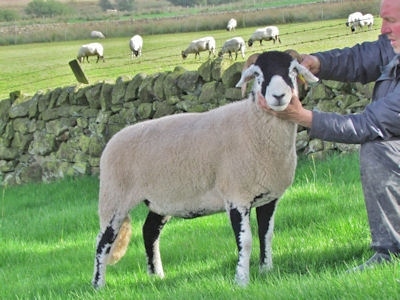 Good legs, good hair and deep black and bright white are sought when purchasing a Swaledale ram. Fine pedigree rams sell up to £30,000, £40,000, £50,000, though the highest price paid at auction for a prized ram was £101,000! We always have a vision in our mind of the tup we would like to find at the sales and normally we have to compromise because of not finding the right tup or the one we choose makes too much money. In 2010 we made the decision to go that extra mile or in this case several miles... At the annual prestigious Swaledale sale at Hawes Auction we managed to buy the Champion Tup (Ravenseat Glory), from Clive and Amanda Owen (“The Yorkshire Shepherdess”). We hoped then that the £28,000 investment would shine through in his progeny. Glory, has lived up to most of our expectations. We have sold several tup shearlings into the thousands, sired by him. We also have some tremendous females in our flock by him including the best female sheep we have ever had (called Valentine), in fact the best Swaledale female we have ever seen! 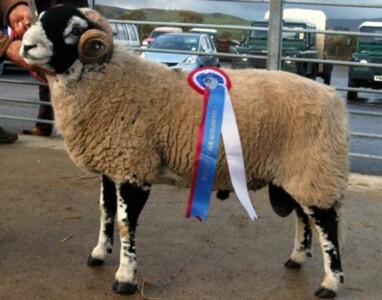 In 2012 our best tup sold for £15,000 to J. Bradley, Penyghent and R Booth, Feizor. Anyway Glory is still going strong and now we are getting some of our best tup shearlings out of his daughters e.g. 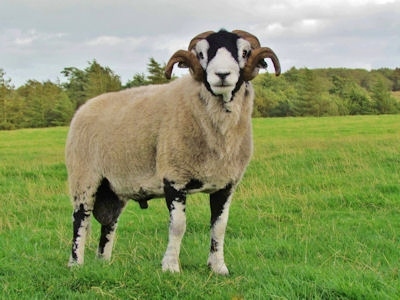 2014 sale our top price was £6,400 out of a Glory ewe by our new tup Noble, who was £46,000 purchased at Kirkby Stephen from Eric Coates, Muker. Noble is a whole new story, after Valentine on the female side, he is definitely the most outstanding Swaledale tup we have ever seen, so far. He partly proved this in 2013 when he was Overall Champion at Tanhill and looked magnificent. Noble the magnificent winning Tanhill. The same as with Glory his first tup shearlings have sold very, very well and we now have some tremendous females in our flock sired by him. 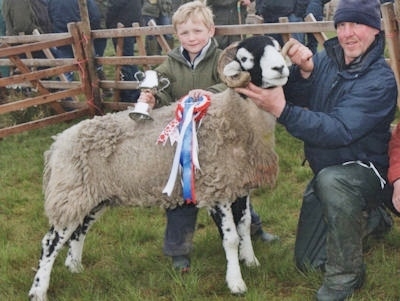 One of which was reserve champion at the annual Swaledale in lamb Sheep Show and Sale at Hawes in January 2015. We showed two gimmer shearlings both by Noble and out of Glory mothers. They were 1st and 2nd prize and two gimmer lambs by Noble at the same sale were 2nd and 3rd.